the designer fruit of the decade. For those of you not aware of this, perhaps you've been hunkered down in a dark cave, with no social feeds, design mags, or frankly...fruit?! We'll forgive you, but get with the program! Every home and its owner (and instagram self-acclaimed model) has been showcasing their latest pineapple purchase and honestly, I am no exception. I have a ceramic pineapple for the coffee table (featured above), a glass pineapple for the sideboard (even with a broken spike) and a vintage, repurposed pineapple bed! And in case that's not enough, we've got two real deal pineapple plants growing at the entrance of our home, hopeful that we'll have a mini-pineapple ready to trim and place in a vase on a quirky matt ready to upload to Pinterest. Why all the fruit fuss, I hear you ask? Christopher Columbus launched the pineapple into widespread popularity when he “discovered” it on his second trip to the New World. The pineapple’s association with welcome and hospitality is traced back to home turf in the to British West Indies, where in the 1600s and 1700s homeowners would leave a fresh pineapple at the gates of their mansions when they were home and open to receiving guests. And it seems not much has changed. The pineapple looks like the very popular pine cone, which had been used as far back by the Romans on monuments and important buildings. The pine cone has long symbolised power and confidence, fertility and grown, and the Romans were infatuated with pine cones. As a 'trinket', a pineapple makes a beautiful statement. Bold, intricate, delicate and historic; it has been hard to resist loading our home with an array of pineapples and yet to purchase an apple ornament would seem so 1990s. It's truly remarkable how cycles of design can make us lust over an everyday fruit and transform it into a design dream. 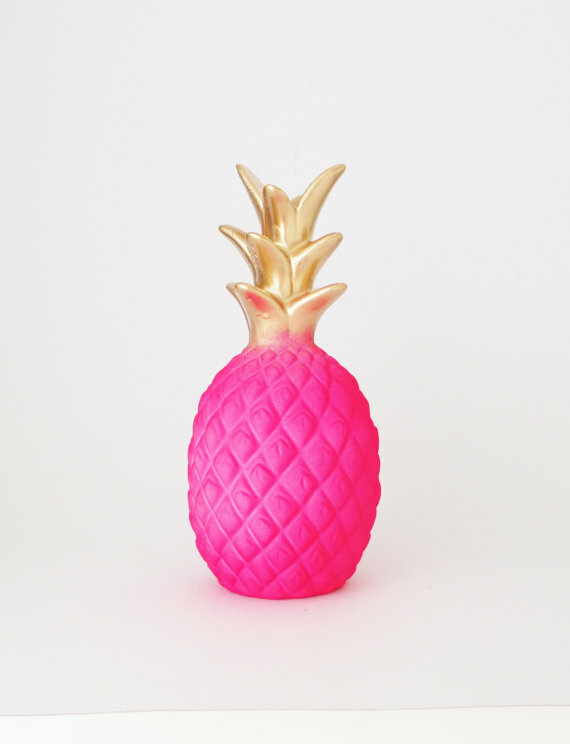 My friend, Elvi, has been lusting to find the perfect pineapple for her home and I'm sure she's not the only one. If all else fails...pop to the supermarket for a fresh pine, grab some gold spray paint and voila! And if you're interested in growing a pineapple, it is super easy! Step three - plant it in soil!